"Grand National Union Banner for 1860"
Campaign banner for Constitutional Union party presidential and vice presidential candidates Bell and Everett. 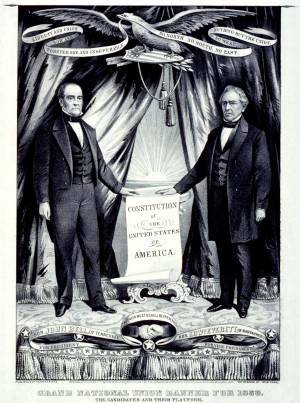 The two men stand before a large curtain, their hands resting on the Constitution. Behind the Constitution, the curtains part to show a rising sun. Above, a large eagle stands on a shield holding a banderole with the motto, "Liberty and Union Now and Forever One and Inseperable. No North, No South, No East, No West, Nothing but the Union." Below the figures are streamers with the candidates' names. The streamers form a loop in the center on which are the words "The Union Must & Shall Be Preserved." Within the loop are two clasped hands.